A historic renovation that will create a unique urban street environment is unfolding in Watertown, Mass. Arsenal Yards, Boston's new mixed-use destination development, will offer a variety of shops, local and regional restaurants, office space, housing and entertainment venues. "East End Watertown abuts two of New England's most culturally and economically significant cities – Boston and Cambridge — bringing the best of Greater Boston together to create a unique destination," said Justin MacEachern, director of construction, Boylston Properties. "The area's eclectic vibe, coupled with its people, proximity and paychecks, all contribute to what will be the next great neighborhood. "The heart and soul of Arsenal Yards is a connection to its heritage and a commitment to its future. By intertwining the past and the present, Arsenal Yards will re-expose the two original Arsenal buildings, which were partially hidden." Developer Boylston Properties, which specializes in mixed-use urban projects, has teamed with the real estate development and management firm The Wilder Companies on the project. J.P. Morgan has invested $109 million in Arsenal Yards, which also is supported by a more than $220 million construction loan. "The greater Boston/Cambridge area is experiencing tremendous growth in the four main ecosystems of technology, healthcare, finance and higher education," said MacEachern. "East End Watertown, on the urban edge, is a beneficiary of this growth, as witnessed by the new office and residential construction in the immediate area. "Within a 10-minute drive of Arsenal Yards you'll find 1.2 million people, a median age of 35, 993,000 employees, 476,000 households and an average household income of $110,000." The project team includes architect PCA; civil engineer RJ O'Connell & Associates Inc.; and landscape architect Carol Johnson and Associates. Crews officially broke ground in spring of 2018. Construction is currently on track to be finished by the end of 2020. Upon completion, Arsenal Yards will total more than 1 million sq. ft., including 250,000 sq. ft. of shops and eateries. 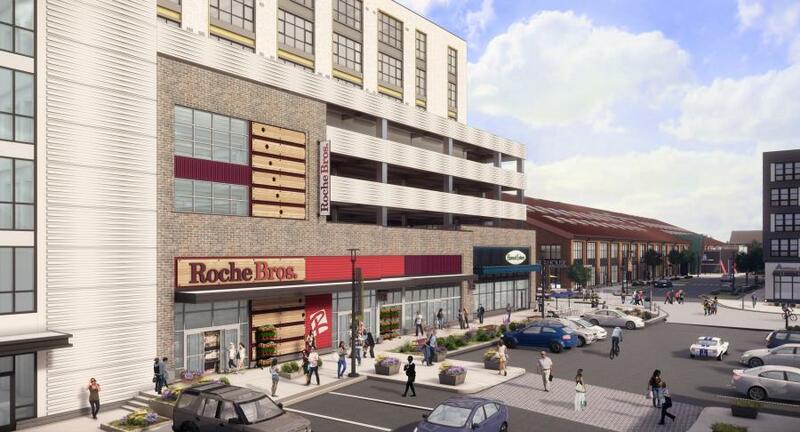 Anchors include Roche Bros., City Works Eatery & Pour House and Majestic Cinemas. 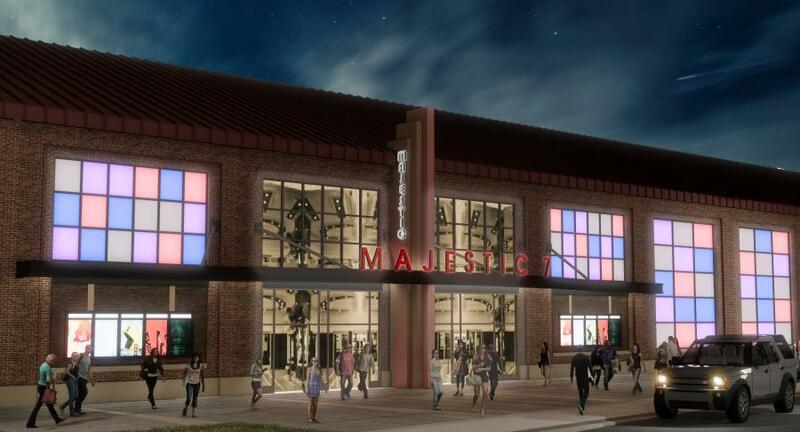 The Majestic at Arsenal Yards will offer seven screens, including a large format screen spread over 33,800 sq. ft. It will feature décor that pays homage to the heritage of Watertown's Arsenal, enhanced with modern-day amenities that include recliner stadium seating and 4k laser projection. In addition, YardWorks will include 107,000 sq. ft. of new creative office and lab space. It will feature a 150-room Hampton by Hilton hotel and 425 contemporary residences. Arsenal Yards will include a mix of studio, one, two and three-bedroom apartments housed within three distinct residential buildings. Fifteen percent of the apartments will be designated affordable housing. The plans also calls for a dedicated green space and revitalized park. "The existing 19-acre Arsenal Park is being re purposed with our input. In addition to existing uses, including youth baseball, soccer and tennis, we are working with the town to design space to activate community gardens, more bike paths, connections to the river and an amphitheater for outdoor concerts and entertainment." MacEachern said the project has been in the making for a while. "We've been involved with rezoning in Watertown, because it's going through a lot of wonderful and dynamic changes. The vision that the town had come up with five or six years ago — their comprehensive plan and their vision for this part of Watertown — was perfectly in sync with what we wanted to do. We're starting to see that come to fruition." MacEachern said it's rewarding to see construction moving forward, bringing the project one step closer to completion. "We have a very large team who has dedicated years to planning, designing, permitting and financing this project. To see the financing close and the construction break ground is a huge milestone. The entire team is very excited to see this project moving forward, as planned." The most time-consuming part of the job has involved site logistics and planning. "It's about making sure that a good plan is in place, prior to buying out each phase of the project. If things seem to not be planned well, or there is confusion on how we want to approach a certain aspect of the project, that many unnecessarily drive up the construction costs. It's critical that we look at the big picture and understand how we want to approach the entire development and then take a deeper dive into the details of how each of the individual buildings fit into that larger plan. We have an incredible team of consultants and contractors who have been helping to ensure this project gets off to a successful start. "It's a large project. Early on, there is a lot of soil to be moved. Probably one of the most complicated aspects is the scheduling of work to coincide with the leases we are signing for new retailers. We need to understand who wants what open and completed before they are willing to open, how much parking needs to be available at that time, what roads need to be open, does the river green need to be completed? Every lease has different requirements that we must meet, it's our job to ensure we keep track of all these different requirements, and plan the construction accordingly." Phasing of construction is one of the more complicated aspects. Determining how and when is the best way to approach each individual building doesn't happen overnight. "There are many reasons the work needs to be performed in stages, one of them being that we have existing retailers that are staying open during construction. It's critical that we are fair to them, and leave the site accessible and safe to the public, their customers. We also owe our tenants parking. It makes more sense to construct and open the new parking garage prior to tearing up the parking lots where the future wood frame residential buildings sit, so as you think of through these things, the stages of construction start to form. "During the excavation phase alone, there is a lot of dirt to move. There are areas we need to excavate for underground parking, there are other areas we need to raise to make the grade more level. Without some phasing, if we tried to perform all the work at once, all the contractors would be on top of each other. There's a lot to think through, and we've taken the time to respect the integrity of the project and all parties involved, which ultimately leads to phasing out the work." Technically, there are four phases, beginning with phase 1 retail openings, which are anticipated to open in 2019. The entire project, including retail, restaurants, office space, a hotel, apartments and condos are set to open by the end of 2020. Crews are renovating two existing buildings and building five new ones, all within roughly two-and-a-half-years. 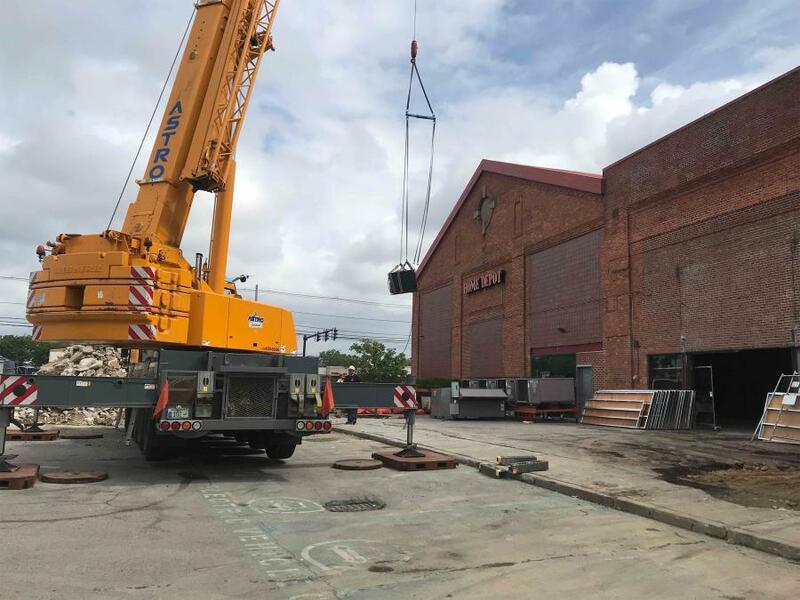 The two historic structures that comprised the original Watertown Arsenal, an ordinance depot and small arms factory built in the early 1800s, will be retained and restored, featuring re-exposed classic masonry and original steelwork. They will be reintroduced as street front retail, and make up approximately half the total retail space. Shoppers are coping with the nearby construction as best they can, with a number of stores remaining open and parking clearly marked. Signage and a police detail are present at each end to help redirect traffic. Real-time updates are provided via the official website and social media channels. Easily accessed from major thoroughfares and public transportation, the center currently serves residents of Watertown, Cambridge, Boston, Belmont, Brookline, Waltham and Newton. Performing construction tasks while the mall is still open has been a concern from the beginning. "It adds several precautionary factors to an already congested site," said MacEachern. "Whenever you introduce the public to a busy site, there are always more challenges, but at the end of the day, our top priority continues to be keeping everyone involved happy and safe. Things may not always go exactly as planned, but everyone's working very well together, especially since, in the end. we know that we're all going to be part of an incredible space." Keeping patrons out of harm's way is paramount. "It's a daily conversation throughout the site, at many different levels, and always comes first. The safety of the public who continue to park and walk through the site each day to visit the open retailers is certainly a top priority. Then there is the safety of each person that comes to work on our site each morning. Anyone starting on the site must attend a new worker orientation and they are required to attend daily safety huddles each morning. Our ultimate goal is to ensure that everyone leaves that site each and every day the same way they arrived." The largest demolition scope is now complete, having taken close to three months to complete. This involved tearing down the addition to the malls, as well as gutting the interior of the existing Arsenal buildings. A large demolition project, it was considered a very significant and critical piece to kicking off the Arsenal Yards development. Excavation is well under way for the new parking garage. 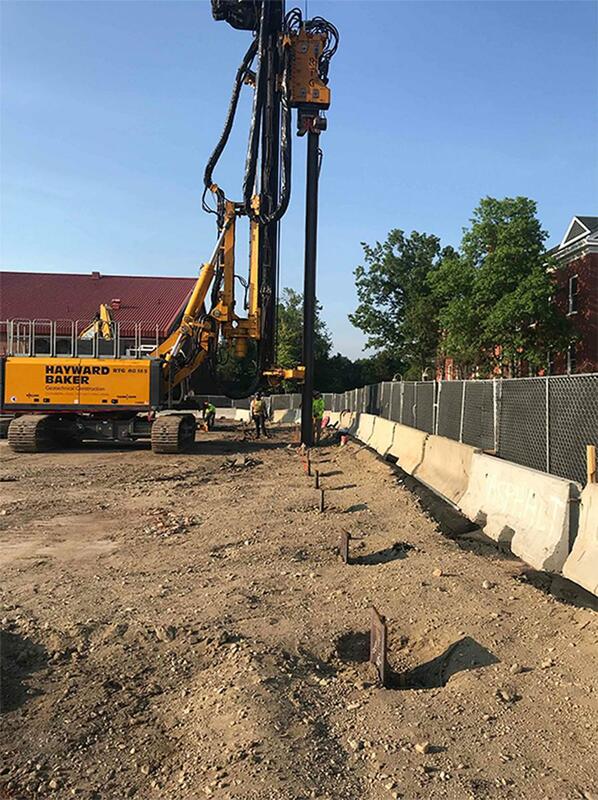 Mini-piles are currently being driven and pouring concrete for the footings has begun. The precast garage itself is cast and ready to be delivered, as soon as the site is ready for the slabs. "There has been a lot of enabling work that needed to be completed before excavating and demolition could commence. Once enabling was complete, the buildings constructed in the 1980s were demolished to open up space and land between the two original Arsenal buildings, which will be preserved, renovated and open in 2019. 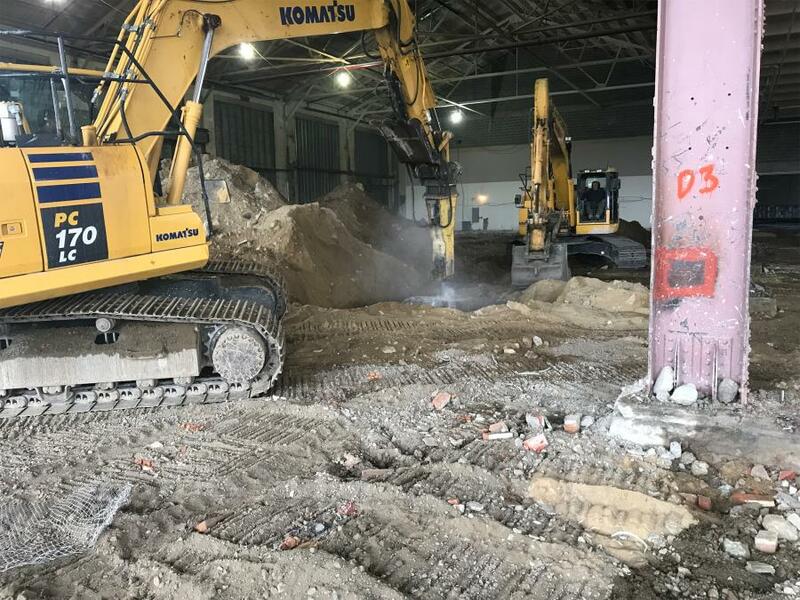 The interior of one of the buildings has been completely gutted, and the second floor of the mall, above the current retailers, has been demolished and ready to be transformed into our new office/lab space. 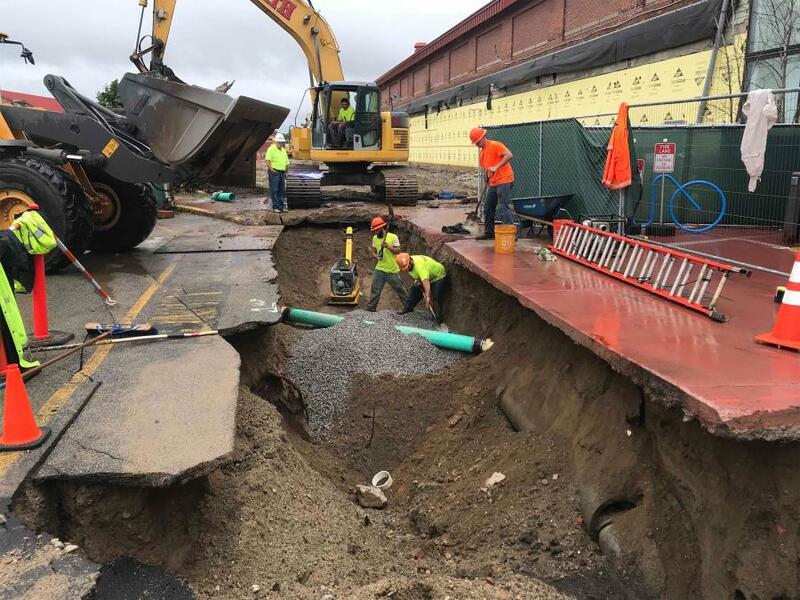 The soldier piles and lagging were installed within the footprint of the future garage, which allowed the excavation needed for the underground parking to occur." 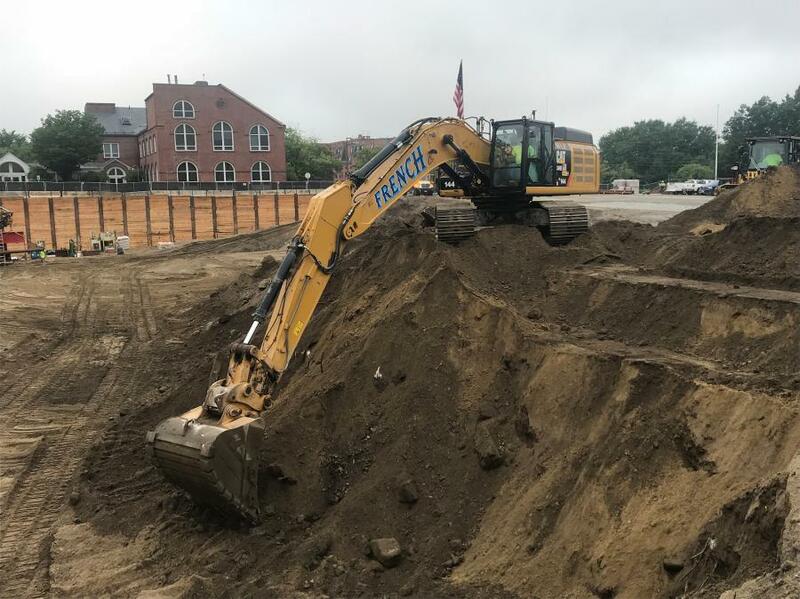 There are many milestones on this project, the next significant one being breaking ground on Building F, which is the first residential building to be constructed, and where Roche Brothers will reside on the first floor. "We'll continue to hit milestones, as we break ground on the four additional buildings, complete utility tie-ins and construct a mixed-use path, which will connect the bike path down to Greenough Boulevard and the river. There will be milestone openings of retailers, apartments, lab and office space. We're continuing to sign more leases and will be renting out three buildings of new apartments." Nearly 100,000 cu. yds. of soil is expected to be removed from the site and disposed of on the project. Much more will be moved as soil is reused, utilizing it in areas where workers are excavating for underground parking for fill in current low areas that need to be brought up to the ultimate finish grade. 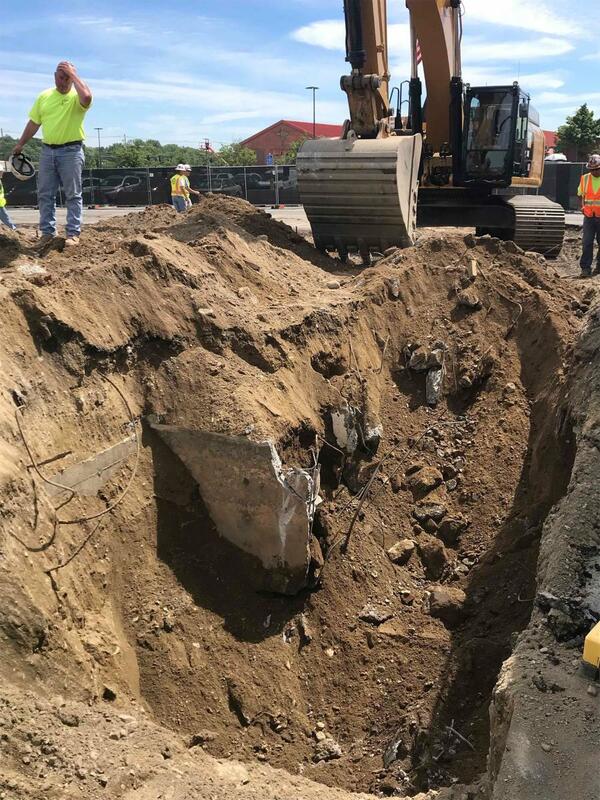 "Support of excavation (SOE) was used on the two sides of the excavation that border streets that we need to leave open, adjacent to Marshall's and HVMA. In these locations, we use soldier piles and lagging with tie-backs. as required. Where room allowed, we slopped the excavation, so that SOE didn't need to be used." Construction continues on the garage site, along with the clearing of rubble from demolition. "First is making sure all environmental concerns are discovered and remediated as necessary. It is always amazing to me how the equipment so easily seems to tear the existing structure down. In some locations, such as at the connection points to the original Arsenal buildings that we are restoring or near public areas, the demolition is done much more delicately. In other areas, you grab hold of a supporting beam, column or wall and tear the structure down. "Once the structure is down, like material is sorted into piles and then loaded and hauled away. 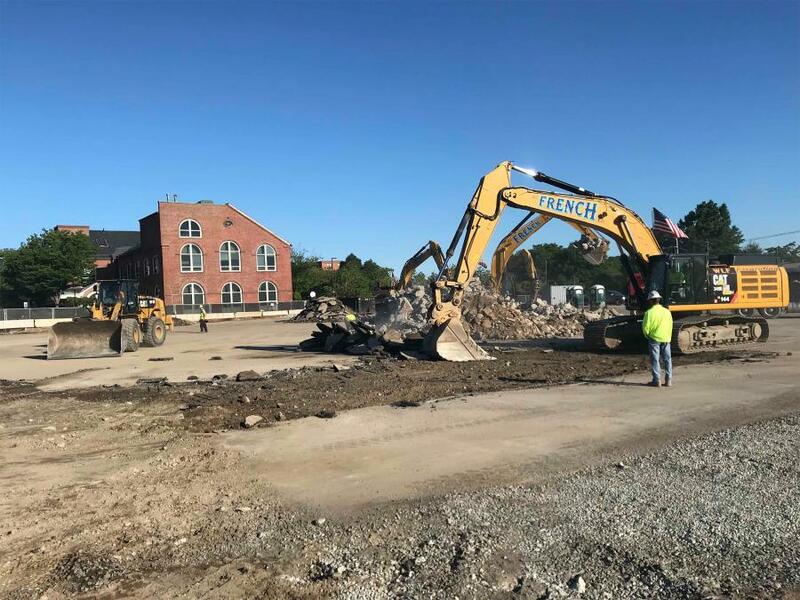 Once the building itself is cleared, the demolition of the existing slabs and foundations occurs, which are hammered or jacked up and hauled away. 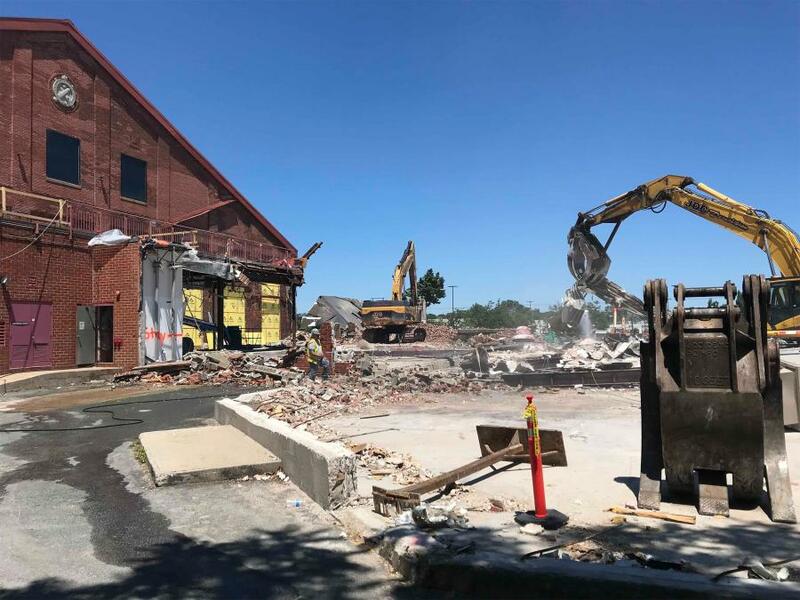 It sounds simple, but there is certainly a science to properly performing demolition, and the machine operators are very skilled at what they do." Heavy equipment currently being used on the job includes a Cat C556 roller; a Cat 980G front-end loader; a Cat 349E excavator X2; a Cat 966K front-end loader; a Cat 321D excavator; a Cat D6R bulldozer; a Cat 345D excavator; and a Komatsu PC228 excavator. Various attachments are used on the equipment to perform the work, such as grapples, pulverizers, claws, hammers, shears, buckets and thumbs. Some of the main materials being used during construction include steel, concrete, precast, brick, wood, glass and metal panels. Although much work remains, MacEachern and other involved in the highly-anticipated project are convinced the endeavor will have a profound impact on the area. "Arsenal Yards will offer an urban vibe with access and convenience to curated retail and unique dining options and entertainment venues. It's a destination where we want people to come and have an engaging, social experience."